Emily is originally from Cazenovia, a small town just outside of Syracuse, NY. She received a B.S. in Biology at Hobart and William Smith Colleges and returned to Syracuse to receive her Doctorate of Physical Therapy at SUNY Upstate Medical University. Emily has clinical experience in outpatient and rehab settings in Syracuse NY, and in the hospital setting in Dallas, Texas. During her time at Upstate, Emily chose to learn more about current topics Sports PT from physical therapists that are employed by the MLB and the NFL. Emily was also a member of a research team that completed a study which examined the feasibility of the use of virtual exercise applications on google glass devices with individuals with Parkinson’s disease. 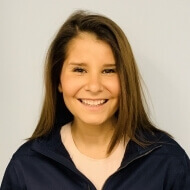 Emily enjoys working with patients across the age spectrum and has diverse clinical interests ranging from sports related injuries to neurological conditions. Emily’s fitness interests include yoga, running, and strength training, and she enjoys incorporating elements from her own exercise habits into her treatment sessions when applicable. During her free time, she enjoys spending time with family and friends, exploring restaurants around the Boston area, and rooting for the Syracuse Orange.